Last year I mentioned that the magazine Her og Nå had decided not to publish a yearbook about the events of the royal family like in previous years. At the time of writing I hadn't come across any royal yearbooks by other publishers either. Later I found out that Se og Hør had an inset in no. 50, 2016. It was only 24 pages long, though, and nothing compared to Her og Nå's Året rundt med Kongefamilien («The Year with the Royal Family») or the hardbacks titled Kongefamiliens årbok («The Royal Family's Yearbook») published in the late 1980s/early 1990s, besides the 2011 edition. The 25th anniversary of the accession to the Norwegian throne of Their Majesties King Harald and Queen Sonja was the major focus of 2016. The celebration started with a large winter festival in the Palace Square on 17 January and concluded with a garden party hosted by the King and Queen in the Palace Park for 1 500 guests from throughout Norway. In June, the King and Queen carried out a silver jubilee tour along the coast from Tromsø to Kristiansand on the Royal Yacht, Norge. In addition to the jubilee celebrations, the Royal Family has had an extensive official programme. Altogether, the members of the Royal Family took part in 740 official events in Norway and abroad. They have paid visits to 48 municipalities, all of Norway’s counties, Svalbard, and eleven different countries. In the course of the busy summer weeks, more than 45 000 visitors attended the activities conducted under the auspices of “Åpent Slott” (cultural outreach activities). The annual reports from 2005 to 2016 are available at the official website. Not sure if the annual reports for 2002, 2003 and 2004 were ever published in an electronic format, but at least I have the paper editions. As mentioned in the press release, King Harald celebrated 25 years on the throne last year, and the annual report tells about all the related activities, including the church service on 17 January 2016 in the Oslo Cathedral. We can also read that the official website Kongehuset.no had close to 1,6 million visitors during 2016, while the Facebook page received 939 500 likes and 30 500 comments. As many as 29 998 people toured the Royal Palace during the summer season, while 5 232 visited Oscarshall (up from 2 718 the year before). As usual many orders and medals were awarded during 2016. The section for the recipients of the Royal Norwegian Order of St. Olav lists 18 people, compared to 26 the previous year. HRH Crown Princess Mette-Marit was awarded the Grand Cross with chain, while Court Marshal Arne Omholt, the President of Poland, Andrzej Duda and the President of Italy, Sergio Mattarella, received the Grand Cross, and in addition the Chief of His Majesty The King’s Military Staff, Nils Petter Granholt, received the Knight's Cross, First Class, just to mention a few. 104 people received the Royal Norwegian Order of Merit, compared to 105 in 2014 and 65 in 2015. Among the lucky recipients were the Norwegian Ambassador to Belgium, Ingrid Schulerud (wife of the Secretary General of NATO and former Norwegian Prime Minister Jens Stoltenberg) and Astrid Versto, the Norwegian Ambassador to Croatia (and former Communication Director at the Norwegian Royal Court). The Medal of St. Olav was awarded to two persons, John Foster Ellison and Perry J. Gulbrandsen. The former is the the Norwegian honorary general consul in Wellington, New Zealand. He also received the Order of St. Olav, Knight 1st Class, by the way. The latter is a retired jurist of Illinois, USA and is or was President of the Nordic Law Club. Obviously of Norwegian descent as well. Just to mention it, 5 people received the medal in 2015. There were 90 recipients of the King's Medal of Merit during 2016, compared to 78 in 2015 and 138 in 2014. Among the recipients in 2016 was Sveiung Danielsen of Sandefjord. He received the medal for «his exceptional efforts of many years to keep and pass on important traditions of culture and craft». He served as a verger in Sandar Church in Sandefjord for many years as well. A well-deserved medal, I would say. The King's Commemorative Medal was awarded to 41 people, up from 21 people in 2015. Never an anniversary without a medal, and King Harald V's Jubilee Medal 1991–2016 was founded on 17 January 2016. Recipients were members of the Royal Family, numerous people of authority (past & present), members of the Royal Court, the King's Military Staff, royal guards who served as batmen (orderly), the Royalty Protection Unit and the Norwegian Directorate of Public Construction and Property's employees at the Royal Palace. 366 people all in all, if I have got it right. For the record, the royal/royalty-related recipients were Queen Sonja, Crown Prince Haakon, Crown Princess Mette-Marit, Princess Ingrid Alexandra, Princess Sverre Magnus, Marius Borg Høiby, Princess Märtha Louise, Princess Astrid, Mrs. Ferner, Ari Behn, Maud Angelica Behn, Leah Isadora Behn, Emma Tallulah Behn, Erling S. Lorentzen, Queen Margrethe of Denmark, King Carl Gustaf of Sweden and Queen Silvia of Sweden. Royalty Digest Quarterly no. 1, 2017 arrived in early April, which meant that I had plenty of reading material for my Easter break. Just a few days earlier I had received the latest issue of Eurohistory as well, in addition to the latest edition of Majesty, which I hadn't had the time to read until Easter. If that was not enough, no. 100 of Våpenbrevet, the newsletter of the Norwegian Heraldry Society, also came in time for my Easter break. And I still haven't read Royal Russia (no. 11) in full either. If that was not enough, I also had to do proof-reading on no. 1, 2017 of Genealogen, the newsletter of the Norwegian Genealogical Society. But back to Royalty Digest Quarterly. The front page reveals that the former royal family of Bulgaria has made it to the family album this time, and the photo shows King (Czar) Ferdinand of the Bulgarians with his children Princess Eudocia, Prince (later King) Boris, Prince Kiril and Princess Nadejda. Charlotte Zeepvat's traditional Family Album this time includes two dynasties – the House of Battenberg represented by Prince Alexander (1857–1893), who reigned as Prince of Bulgaria from 1879 to 1886 and three years later married morganatlically Johanna Loisinger (1865–1951), and the House of Saxe-Coburg and Gotha, represented by King Ferdinand (1861–1948), who reigned from 1887 to 1918, his son King Boris III (1894–1943), who reigned from 1918 until his death, and his grandson King Simeon, b. 1937, who reigned in name only from 1943 until he was forced into exile in 1946. Simeon celebrates his 80th birthday on 16 June this year, by the way. Besides an introductory article about the two reigning dynasties in Bulgaria the readers are treated with 77 photos and 2 genealogical tables. 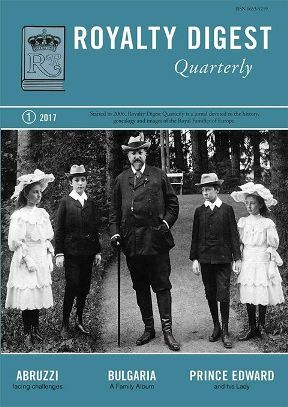 In his Editor's Corner, Ted Rosvall makes a point of the fact that «In this issue, and possibly for the first time, RDQ features and article about Monaco and the Princely House of Grimaldi». It was on due time, I would say. Rosvall continues by lining out the Grimaldi's relations with the other royal and princely houses of Europe. The first article out is written by Charlotte Zeepvat, who opens with a postcard portrait of the Duke of Abruzzi and Miss Caterina Elkins. The article is about Luigi Amadeo, Duke of the Abruzzi (1873–1933), son of Amadeo, Duke of Aosta (1845–1890), who was King of Spain from 1870 to 1873, by his first wife Maria Vittoria del Pozzo, Princess della Cisterna (1846–1876), and the mariage that never took place. I loved the article, as I can't remember having read much, or anything at all, about him before. I would also like to applaud the article The Prince and his Lady. Prince Edward of Saxe-Weimar and Lady Augusta Gordon-Lennox* by Marlene A. Eilers Koenig. As I have said many times before while commenting on RDQ and Eurohistory, I want more articles about the so-called lesser-known royals and other royal relations. Nichael L. Nash has the honor of writing the first article about the Grimaldis. The article is titled At the Court of Prince Albert of Monaco, and is also both interesting and well-written. How to follow up on this? There are so many previous princes of Monaco to write about! Who were all the Honorés and Florestans? And what happened to Princess Delphine, born 1788, who at present isn't even presented with a death year in An Online Gotha? John Wimbles' collection of letters from the Romanian National Archives and other sources is impressive, and in the present issue we get part III of the presentation compiled by David Horbury. The last one out is Coryne Hall with her article Little-known royals. Prince Harald of Denmark. How little-known he really was is of course up for discussion. Nice article, but – and this should be taken in a positive way – it could have been longer. The issue ends as usual with the traditional The World Wide Web of Royalty, this time bringing news of the Imperial, Royal and /or Princely houses of Portugal, Russia, Saxe-Coburg and Gotha, Sayn-Wittgenstein-Berleburg, Schaumburg-Lippe and Waldburg zu Wolfegg u. Waldsee. *The subject title says in fact Gorndon-Lennox, but that is a typo we all could make or overlook, so I corrected the reference above. Erska Church, Sollebrunn. Photo: Artifex, Wikimedia Commons. According to the death announcement published in among others Svenska Dagbladet on 22 April 2017, the funeral service for Baron Niclas Silfverschiöld, who died on 11 April 2017, will take place at Erska Church in Sollebrunn on Thursday 11 May 2017 at 2 p.m. There will be a reception at Koberg Palace after the funeral service. The announcement was signed by Silfverschiöld's wife Princess Désirée, their children Carl, Christina Louise (Hans) and Hélène, grandchildren Anna Margreta, Estelle, Ian and Fred as well as «släkt och vänner» («family and friends»). It is expected that Niclas Silfverschiöld will be laid to rest at the Royal Burial Ground at Haga outside Stockholm. The fourth and last issue of volume 19 of Eurohistory. 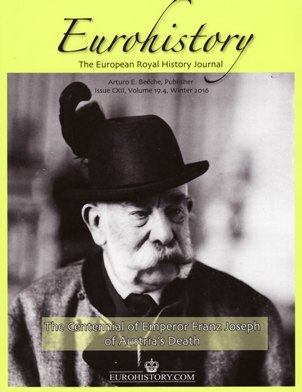 The European Royal History Journal arrived in my mailbox at the end of March. Last year was the centennial of Emperor Franz Joseph of Austria's death, and in the article «Why Cecco Beppe Does Not Die». The death and continuing afterlife of Franz Joseph, Janet Asthton draws a great picture of his death and how he has been viewed afterwards. The next article, Alex Wernher. A close friend of HRH Prince Philip, Duke of Edinburgh by Marlene Eilers-Koenig was also interesting to read, among others because she has focused on a lesser-known member of the royal circle. Alex (George Michael Alexaner Wernher (1918–1942)) was the son of Sir Harold Wernher (1893–1973) and Countess Anastasia «Zia» de Torby (1892–1977). Through his mother he was a descendant of Emperor Nicholas I of Russia, and one of his godparents was King George V of the United Kingdom, who was a friend of Alex' grandfather Grand Prince Michael of Russia (1861–1929). We meet the Wernhers again in Ilana D. Miller's traditional Who is in the Photograph? article, this time titled A Wartime Wedding. The photograph in question is from the wedding of Countess Nadejda de Torby and Prince George of Battenberg in 1916 and shows Prince George of Battenberg, Princess Louise of Battenberg, Countess Nadejda de Torby, Countess Zia de Torby, Princess Xenia Georgievna of Russia and Princess Nina Georgievna of Russia. Miller then goes on with a presentation of the said persons. If you haven't guessed already, Nadejda was the aunt of Alex Wernher, who was killed during WW2. And if you are interested in reading more about the Wernhers and their royal connections, Raleigh Trevelyan wrote the boook Grand Dukes and Diamonds: The Wernhers of Luton Hoo in 1991 (Martin Secker & Warburg Ltd.; ISBN 9780436534041). Paperback and e-book editions were published by Faber & Faber in 2012. But before Miller's contribution, the readers can enjoy two other articles in which members of the Russian Imperial family are involved: Greg King's The Mad King's Other Empress. Ludwig II and Maria Alexandrovna of Russia and Coryne Hall's St Petersburg's Winter Palace, 1903. The Last Costume Ball. Greg King & Janet Ashton. A Life for the Tsar. Triumph and Tragedy at the Coronation of Emperor Nicholas II, Eurohistory, 2016. ISBN 9781944207045. See also Koenig's review at Royal Book News. Robert Golden & Arturo Beéche. ALBANY – One Dynasty, Two Destinies, Eurohistory, 2016. ISBN 9781944207052. Kurt Stjernholm Riisberg. Kongehuset 2016, Linhardt og Ringhof, 2016. ISBN 9788711562246. John Van Der Kiste. Queen Victoria and the European Empire, Fonthill Media, 2016. ISBN 9781781555507. Finally, the Royal News column gives the latest genealogical events in the Imperial, Royal and/or Princely houses of France, Luxembourg, Oldenburg, Prussia, Russia and Schaumburg-Lippe. Baron (Friherre) Niclas Silfverschiöld, husband of the Swedish Princess Désirée, died today, 82 years old, the Swedish Royal Court has announced. Tisdagen den 11 april 2017 avled friherre Niclas Silfverschiöld, make till H.M. Konungens syster Prinsessan Désirée, friherrinna Silfverschiöld. Friherre Niclas Silfverschiöld blev 82 år. Baron Niclas Silfverschiöld, husband of HM The King's sister Princess Désirée, Baroness Silfverschiöld, has died. – My family and I have with great sorrow received the news that Baron Niclas Silfverschiöld, Princess Désirée's husband, has passed away. Our thoughts are with Princess Désirée and her family. Baron Niclas Silfverschiöld was 82 years old. Baron Niclas Silfverschïold, whose full name was Nils August Otto Carl Niklas* Silfverschïold, was born at Gåsevadholm on 31 May 1934 as the son of Baron Carl-Otto Silfverschiöld (1899–1955) and Baroness Madelaine Silfverschiöld, née Bennich (1906–1995). He married Princess Désiree, third daughter of Prince Gustaf Adolf of Sweden (1906–1947) and Princess Sibylla of Sweden, née Princess of Saxe-Coburg and Gotha (1908–1972), in Storkyrkan (The Great Church/Church of St. Nicholas) in Stockholm on 5 June 1964. The couple had 3 children (Carl, Christina and Hélène) and four grandchildren. Niclas and Désirée lived at Koberg Castle at Sollebrunn in the municipality of Trollhättan. Both Koberg Castle and the other Silfverschiöld family-owned castle, Gåsevadholm, are entailed property (fideikommis), the latter have been in the family since 1818. At the time of death, Baron Niclas was listed as either chairman or member of the board of three limited companies – Koberg Förvaltning AB, Gåsevadholms Fideikommiss AB and Borgudden Vind AB. According to Ratsit.se, both Koberg Förvaltning AB («Koberg Management Ltd.») and Gåsevadholms Fideikommiss AB are registered as businesses in agriculture and forest management as well as capital and property management. Borgudden Vind AB, which is a daughter company of Gåsevadholms Fideikommis AB, is an energy production company (wind turbine company). *While the Swedish Royal Court and most genealogies spell his name Niclas with a c, he is in the Public Register listed with the spelling Niklas with a k, cf. Ratsit.se. Updated on Wednesday 12 April 2017 at 00.05 (link added, ownership to Gåsevadholm amplified).